Valdo Panzera Jr. and his wife, Megan Iannuzzi, have given birth to perhaps the youngest survivor of the Las Vegas massacre. Marc Santia reports. 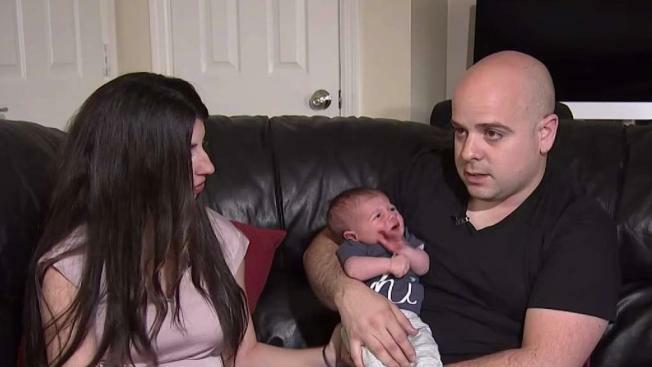 A New Jersey couple who survived one of the deadliest mass shootings in American history has a new reason to smile: They're now holding one of the youngest survivors of that harrowing night. 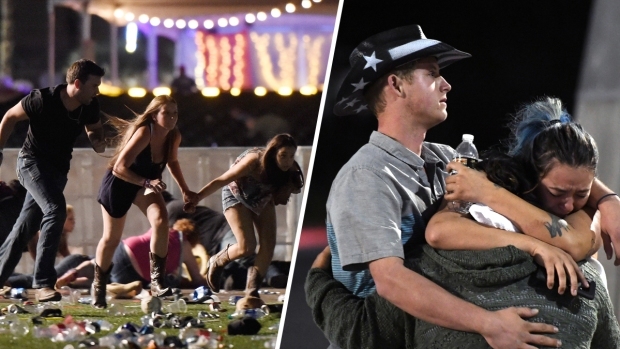 Back in October, Valdo Panzera Jr., of North Haledon, and then-girlfriend Megan Iannuzzi -- a Fair Lawn native who recently moved to Las Vegas to teach kindergarten -- were two of the thousands of people who ducked, then ran for their lives while rapid gunfire rained down on the Las Vegas Village from a pair of busted-out windows at the Mandalay Bay hotel. That's where a gunman was perched with an arsenal of weapons. He killed 58 people and wounded nearly 500 others. Panzera said that he and Iannuzzi -- both country music lovers -- had planned for months to go to the Route 91 Harvest Festival so they could see some of their favorite acts and sing their favorite songs together. When they learned she was pregnant, it turned into a celebration. At the concert, they decided to sit in the bleacher seats. The decision may have saved their lives, as they weren't in the immediate line of fire when shots rang out. "If Megan wasn't pregnant, we would have been right up front, right by the stage," said Panzera. Things took a turn when they heard a mysterious "clap." 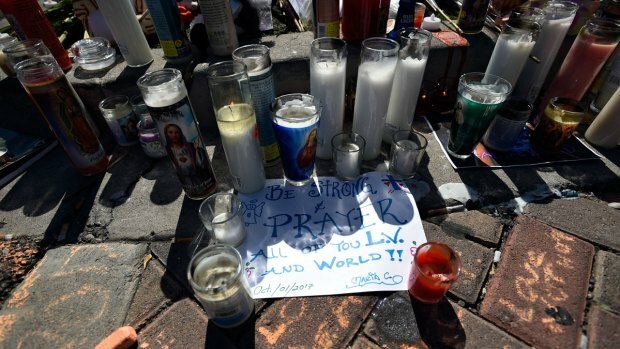 Speaking to News 4 in the immediate aftermath of the shooting, Panzera said that as soon as he realized that the noise was gunfire -- and not fireworks, the crowd or the PA system -- his thoughts shifted to his burgeoning family. "Megan is six weeks pregnant. I'm going to be a dad and I'm just thinking that it's my girlfriend," he said. "My future wife and my child I have to worry about." "Megan turns to me and goes, 'Babe, what was that?' -- I'm like, 'I don't know, fireworks?'" he said. "All of the sudden you hear it again. 'Clap, clap, clap, clap.'" By the third round of fire, he knew what he was hearing. "The third round of bullets, you hear 'Bah! Bah! Bah!' and I felt the vibration," he said. "I told Megan, 'Get down. Get Down!' and we literally got down and you kept hearing it." Months later, holding Valdo Panzera III, the new parents want to thank all the strangers who helped them survive that night. They recall a mystery man in the crush of the crowd. "I turn to the guy behind me and I'm like, 'Please don't push her, she's pregnant. Please don't push her,'" Panzera said. "The guy starts screaming [to the crowd], 'Stop, stop pushing. Stop pushing!'" "If it wasn't for him, [baby Valdo] might not be here, too, because people may have pushed us and trampled us," he said. And then there were the strangers who ripped down a fence for Panzera, Iannuzzi and many more to escape. "Thank you for breaking down the fence," Iannuzzi says. "Thank you for being that strong to get us out of there." "Because of them, he's here and we're here. They're heroes, too," said Panzera. In the eight months since that night, Panzera and Iannuzzi have gotten married, moved back to New Jersey and bought a house in North Haledon. But they still have not been to a concert since the shooting and aren't sure if they will ever take their son. Iannuzzi said she doesn't feel comfortable yet. But for now, mom and dad are enjoying the little things. "The day when you become a father, it's a life-changing experience," said Panzera. "This is my world right here. I love it. I love every moment of it."